Don't you want days like these? I was always going to have to restrict trips to the mountains this year; a little someone at home needs me! I did however manage to escape to the Swiss Alps for a few days last month. These trips are going to be few and far between in the near future, I have to make them count, so a special route was planned. I had been to the area before but there were a few specific climbs I wanted to bag. 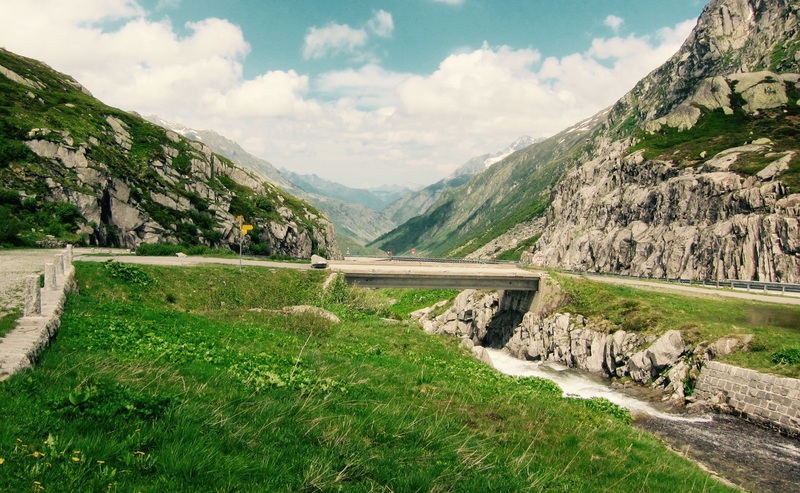 I was committed to one date, but four weeks before there was a rock fall closing one of the key routes I wanted to include, the infamous Gotthardpass. As the Tour de Suisse was due to pass here the same week, I was sure it would be cleared by then. Over the next few weeks I constantly checked for updates, unfortunately the situation just seemed to get worse. Similar to the collapsed tunnel near Alp D’Huez that would ultimately be closed all summer and affect the Tour de France, it was clear that the road would be blocked for a long time, as the rock fall had made the road unsafe and needed to be totally re-built. Also heavy snow was still making some passes unpassable. To add to the problem a week before the weather forecast predicted heavy thunderstorms all day. Three days before the forecast intensified to a biblical downpour for the Saturday. It was clear I’d have to pack my best cagoule! Luckily for me I had a man on the inside. My host, mountain guide and fellow Cent Cols veteran Gerald had a plan. The lower slopes of the Gotthard were indeed totally blocked, but as it turned out it was not on the classic side we wanted to climb, that was clear. It was only the lower slopes that were blocked, so a clever plan was hatched that involved not one but two train journeys during the ride. The day before I rode a great loop around the Klausenpass and Pragelpass. I had baked in the heat and was slower than planned so it wasn’t until 11pm, after a road trip that we booked into our hotel. A hotel we would only be in a couple of hours, as it would be a very early start the following day. Now early starts are ok by me but having to miss the hotel breakfast is against everything I stand for! And it was raining, heavily. Starting a long ride in these kind of conditions is tough. You are instantly soaking. Even the best kit is fairly useless after a few miles of this kind of deluge. Andermatt was the town affected by the road closure. Main traffic bypassed it through a tunnel, so it resembled a ghost town, almost cut off save for the train. We popped on the train and it took us past what was now a construction site at the base of the mountain. A major engineering project was underway reconstructing the road and landscape. First up once back on the bike was the Furkapass (where scenes from the 1967 Bond film Goldfinger were filmed). The rain was constant yet this added to the beauty of the climb. We never saw a soul, as we chatted and pedalled upwards. The top was misty with little visibility. We were in luck though as the rain stopped for the descent. Fun and exhilarating, the freewheeling was short lived as the 14km Nufenenpass beconed. Another stunning road. Infact the whole area is just wonderful. Now we had 160km planned that day, climbing five peaks over 2000m each, but one thing I’ve learnt is that there is always someone doing more. And we met him early into the ride! We passed this gent on an old school eighties bike, with no rain kit and really high gearing (ie no low gears to ease up the climbs with). Once chatting we found out he had starting riding 2 or 3 hours before our early start and planned to continue all day and well into the evening solo! No high tech gels or performance drinks for this chap, he was just planning to chomp on a bit of chocolate every four hours or so! Suitably impressed we cracked on. I guess the iconic highlight of the day with the Gotthardpass. A climb that included 7km of cobbles had been on my bucket list for a long time. It did not disappoint, a joy to ride. Made so good due to the fact that no cars bother to use it, as there are two other faster roads they can use. We were alone together climbing in the mist. Vintage stuff. After the Oberalpass it was back on the train again. The forecast had proved wrong as now the sun was beating down on us. The train excursions had made it so much more of an adventure. To finish the day we had the Sustenpass, an amazing 18km climb. Views of the road ahead were as far as any mountain I can recall, due to the nature of the road there were very few hairpins. Despite being close to early evening now, the sun was cooking us on this exposed road. But as so often when climbing all day, my legs seemed to be the freshest they’d felt all ride. That was my little trip to Switzerland done, so if Gerald ever offers you a hosted ride in the Swiss Alps, jump at it, just take your railcard, climbing legs and a cagoule. Ich liebe Berge.